Ivan Birchall - Ready Steady Gone! Some time ago I had the idea of including some pages on Ready Steady Gone about non-musicians who were part of the sixties north east music scene; managers, promoters, agents, studio owners etc. 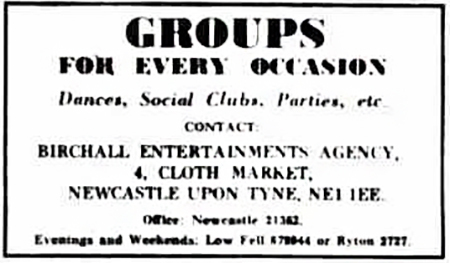 While I was doing some research on the internet regarding these people I found out that one of the top Newcastle booking agents of the late sixties and early seventies died on 21st June 2009. The agent in question was Ivan Birchall who ran the Birchall Entertainment Agency. Anyone who was in a band at that time would have either known or heard of Ivan. He had most of the top local Tyneside and Wearside bands of that period on his books and also the best local venues. Ivan Edwin Birchall was born on 5 May 1943 near Wigan. He grew up in the north west and on leaving school went to work for Pilkington Brothers the glass manufacturers in St Helens. He became involved in the entertainments industry when he went to work for the Rank Organisation in Scotland. He subsequently moved to Newcastle where he was the manager of the Majestic Ballroom. 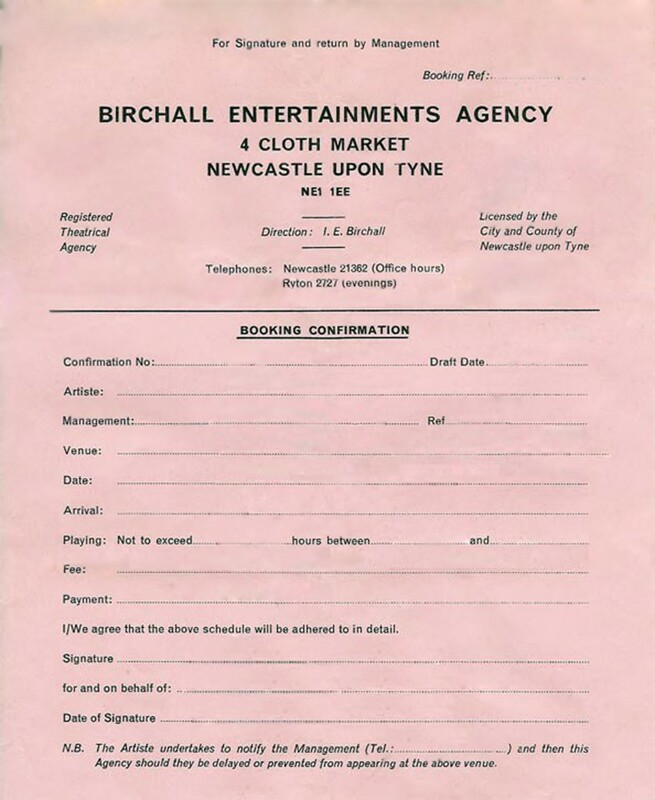 He worked with the booking agent Jack Wright in Newcastle for a while and then around 1967 started his own business, the Birchall Entertainments Agency. Ivan’s agency in the late sixties and early seventies was situated in a small office suite in Newcastle’s Cloth Market. Ivan ran the business personally with the aid of a secretary/girl Friday called Susan. (Susan was subsequently replaced by Janice in 1970). 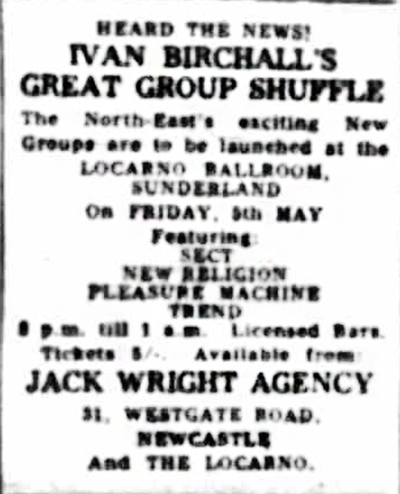 Ivan provided lots of gigs for popular bands on his books (the ‘A’ list) such as the Sect, the Elcort, Pleasure Machine and Mr Poobah’s Chicago Line at places like the Mayfair and the Rex Hotel at Whitley Bay. He also had plenty of work for up and coming bands (the ‘B’ list) that still had to make a name. He used his top bands as a bargaining tool to get venues to accept bands from the ‘B’ list. Apparently his A list bands paid a 15% commission whereas those on the B list paid a 10% commission. In 1967 there was a big shake-up of the groups that were on Ivan’s ‘A’ list with a lot of personnel changes, in particular involving the Sect and Elcort. At the time this became known as ‘Ivan Birchall’s Great Group Reshuffle’ and was advertised as such in the local press. Ivan was an easy person to do business with and always gave the impression that he was doing the best he could for your band. 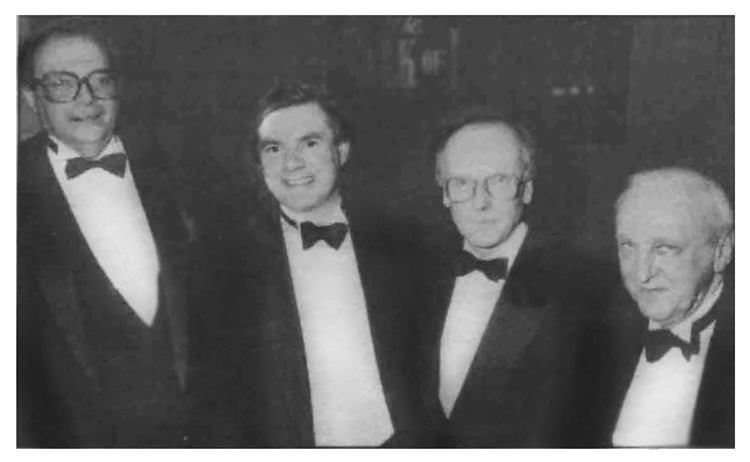 In his later years Ivan became General Secretary of The Agents’ Association of Great Britain and also Treasurer of The European Federation of Performing Arts. He lived mainly in the Champagne area of France in the small city of Sezanne, which is about an hour’s drive east of Paris. 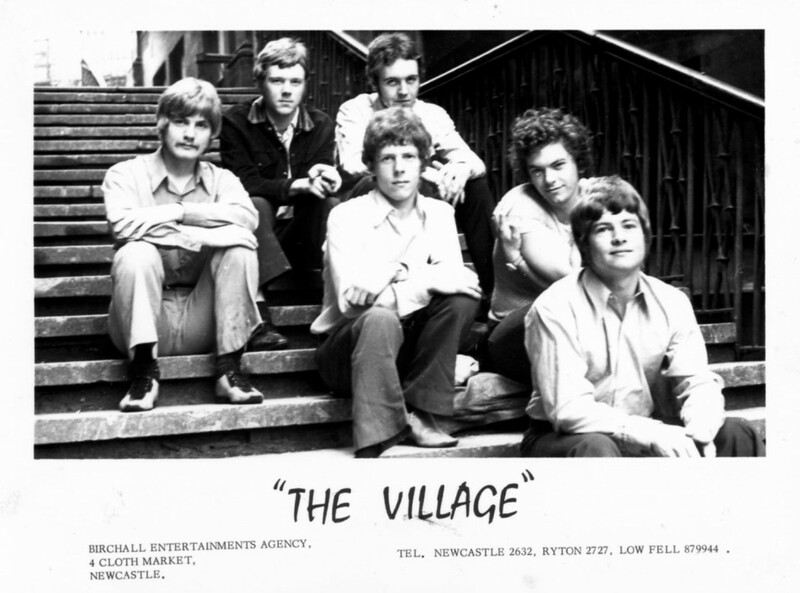 He’ll be fondly remembered by the musicians from the sixties and seventies who know the contribution Ivan Birchall made to the north east music scene of that era. Ivan was a real gent in every respect: looked the part and acted the part. His wife June was the matching Lady. Ivan cooked us Sunday lunch one time and roasted the beef in Brown Ale; this was back in the '70s and was a real revelation to us young thugs. I heard from someone, significantly older than me, that Ivan had also worked, albeit briefly I suspect, at The Go-go; anyone remember this? I was too young. His office doorway was actually on Drury Lane, which runs down from the Cloth Market to what had been the first Theatre Royal, before Grainger pulled it down barely years after it was built. I seem to remember Ivan bumped up the commission from 10 to 12%, - I couldn't swear to this; it might have been 15 - when he created his A List in 1970. Where are Susan and Janice now, one wonders?